Until I had children, I couldn't be bothered with playing games. Couldn't stand poker, pinochle or gin rummy. Bored out of my mind by Sorry! and Stratego. 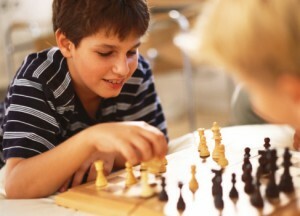 Never understood the appeal of chess, checkers or backgammon. But once I had kids, games took on a new appeal. Apart from entertaining my kids on rainy afternoons, I saw how many different skills games helped to develop. Card games like Uno and Go Fish helped my sons learn to recognize colors and numbers. Board games like Candyland and Chutes and Ladders reinforced their burgeoning conception of a linear number line. And word games like Scrabble and Boggle, which we’re just beginning to try out, promise to expand their vocabularies and enhance their understanding of word stems and endings. clueless, or just playing dumb? Can everyone tell that I’m planning to go out in a blaze of glory on the next round? The study, conducted by a group of researchers from the University of California, Berkeley, used functional magnetic resonance imaging to show that different brain regions are active when individuals play a game against other people and when they play against themselves. This “mental model” of other people’s thoughts and feelings, also known as theory of mind, is crucial for the development of empathy, perspective-taking, and social reciprocity—all the skills that allow us to get along productively with others. OK, so in this case we’re trying to understand the other person so that we can completely crush them in Battleship. But the ability to adopt another person’s point of view is an aptitude we should want to foster at every opportunity, in every setting. Cultivating children’s theory of mind is a game that everybody wins.